When I was one of Jehovah’s Witnesses emphasis was placed in being in “good standing” with the organization. This good standing would give you privileges others with less than good standing status would not receive. Being in good standing with the organization could lead to you being given additional congregational responsibilities such as the magazine counter, microphone handler, Watchtower study reader, appointment as Ministerial Servant or Elder. What placed one in good standing with the organization? Well, it was things like regular meeting attendance and regular participation in the field service arrangement. Even back when I was a Jehovah’s Witness, I secretly developed a problem with that arrangement because I saw that those who attained the status of Ministerial Servant and Elder – or given other congregational responsibilities – were men who either had money, had no family or family responsibilities, had a higher education, were disfellowship and were reinstated, and who were predominately White men. The “White man predominance is a reflection of the Governing Body racial makeup. Yet, I saw hard working men and women – many of who had limited means, jobs and families to care for – who were more deserving than those who had deep pockets. But they were invisible because family responsibilities consumed their time and energy to be able to attend all of the meetings or participate in the field service arrangements. The Watch Tower organization would make missed meetings and not producing so many hours in field service “a problem.” Yet, if a man who worked two or three jobs to take care of himself and provide for his family was not as important to the organization as “getting to the meetings” and “getting out in field service.” The demands and burdens for the hard working man and the single mothers was and still is tremendous. Yet, if a man did not provide for his family , he was chastised. Yet, at the same time, he had to be at all of the meetings and do field service. This is a damned if you do and damned if you don’t situation. Yet, Jesus spoke of his yoke being kindly and his load light. This is not so with the Watch Tower Bible and Tract Society and indeed all religious organization. I have to admit – truly – that it was a burden you never felt free to express love to all persons outside the organization. It was lways in the back of my mind how Jesus showed love and concern for those not deserving it. So what had made me a snob to show love only towards those who were Jehovah’s Witnesses? It was the Watch Tower organization. It creates an “us” versus “them” (worldly people) mentality. Jesus NEVER did that Jesus NEVER condemned an adulterous woman, but showed love and concern for her. Jesus NEVER condemned the condemned man who he primised paradise to at Luke 23:43. Jesus ask that his pesecuters and executioners be forgiven. Yet, an organization claiming to be God’s earthly organization creates a rift between itself and those it classifies as condemned worldly people. The very ones who Christ has pity for and gave up his precious life for. It is the hypocrites – those claiming to know God and Christ – who are under scrutiny by God and Christ. God will ask, “Why have you no listened to my Son?” Christ will ask, “Why have you not followed my example?” Not only does this apply to us today, but also to those in the past – such as the Apostles – who may have engaged in a practice or taught something Christ did not. They were imperfect men, were they not. Many make the assumption because their names appear in the letters they wrote, all that they wrote was ALL from Christ and no human insertions were made. Yet, all religion is a control mechanism and a burden to the masses and it will NEVER let the people KNOW that they (the people) are in good standing with God. Never! If they did that, then they would not be needed anymore. So Religion keeps the masses unbalanced and uncertain and dependent upon THEM. This how the people are weighed down. Take my yoke upon YOU and learn from me, for I am mild-tempered and lowly in heart, and YOU will find refreshment for YOUR souls. For my yoke is kindly and my load is light. The masses are so bogged down with rules, regulations, and rituals that they do not see that they are physically, mentally, anspirituallyly burdened. They are not free! Religious organization has shackled them. It has taken control over their ability to reason and think for themselves. Rather than assist a person in need monetarily, the Watch Tower organization cleverly asks for donations for Kingdom Hall builds (real estate investment), upkeep of the Kingdom Halls, and support of the worldwide preaching work which involves printing books and magazines. Yet, not one red cent is provided for those in dire need. Religion is a business, even the Watch Tower Bible and Tract Society. Does oen really think God needs our money to fulfill His purpose? Any monies given should be used not to build elaborate buildings, but to give to the poor and help those in need. There is no special collection box in the back of the Kingdom Hall for that. The organization demands full dedication to it and in return gives back nothing. Christs teachings are not for sale. Yet, EVERY so-called christian religious organization is in the game and they ALL have their own hooks. The Watch Tower tries to make it appear that it is different from the others, but I and many others (who are still Witnesses) know that this is not true. The Watch Tower organization holds a tremendous amount of wealth and real estate. It claims that it is for the purpose of printing literature and maintaining printing presses and Kingdom Halls. This is not the full story. What I have seen in my 30 years as a JW – as I have travelled the world is this: In the affluent neighborhoods in the United States, the Kingdom Halls are elaborate. Those within the poorer communities are no so elaborate, especially in teh deep South. More money is shifted to teh affluent – typcially the White neighborhoods – and less to the Black, Hispanic and Asian ones. Overseas where I have lived many years (I live in Africa now), it is appalling to see what the people hold their meetings in. I have been to Kingdom Halls in the Philippines and Thailand, that had one light, no windows, windows but no glass in them, cheap plastic chairs, no carpet, no AC, and no toilets. Here in West Africa, I – the only African American JW to come here about twenty years agao – participated in building the first Kingdom Hall. It was shameful what “The Organization” gave them for materials. It equated to a shack. A standard no American Jehovah’s Witness would be accustomed to. I stopped counting the number of times JW “Sisters” in the congregation I belonged to complain about the air conditioning or the color scheme of the Kingdom Hall they were in. The WatchTower Bible and Tract Society and indeed all of the religious system called by men – Christianity – is a White mans club. Yes, there are Blacks, Hispanics and Asians within that organization, but they are indoctrinated to think like White folk and even adopt many of their characteristics and manner of dress. Don’t let me get started on this becauseI could write a book about it. I could not help but remember the beautiful – but deceptive – illustrations in the many publications and I always wondered why – in the ones showing paradise – why there were more White people than anyone else. And they were ALWAYS in the front. 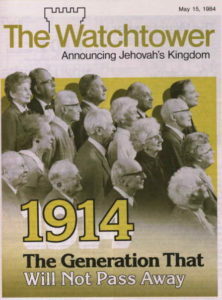 The Watchtower maganize cover below really gives one an idea WHO it is teh Watch Tower has in its mind: White people. How many people of color do you see on the cover? Not one. This is typical of all of their publications. I tell you, peopel of color do not really count, we are only needed to be workers in the field. I often wonder what mentality that sits at the top of the organization, would sanction an EXCLUSIVE cover like this? Yet, this is the image that teh Watch Tower organization wants to present to the world. If you are a Black man or woman, you had better act White and get with the program. You had better push images of Adam, Eve, Jesus, Angels and others as White – and defend them, if necessary, or else. One did not see this kind of behavior and activity in Jesus’ day. Moreover, what I wanted to emphasize here is this “good standing” with the organization. I would be more concerned about being in good standing with God and Christ than “The Organization.” Yet, the Jehovah’s Witness thinks that being in good standign with he organization is the same as being in good standing with God! That is impossible, and hear is why? The power of life and death is not within any organization. If the Watch Tower promotes being in good standing with itself, then it is essentially saying that it has the power of life and death and that it is God! This is not my imagination here people. What I have just stated can be seen in teh baptismal vow all Jehovah’s Withess have taken. Close reading of the baptismal vow says that unless one is associated with Gods spirit-directed organization (notice the self-proclamation and assumption), they canot eb viewed as a servant of God (a Jehovah’s Witness). Think about that. Do you understand that your dedication and baptism identify you as one of Jehovah’s Witnesses in association with God’s spirit-directed organization? Notice that one can only be identified as one of Jehovah’s Witnesses if and only if they are associated with the organization. So what does that make persons not associated with the organization. 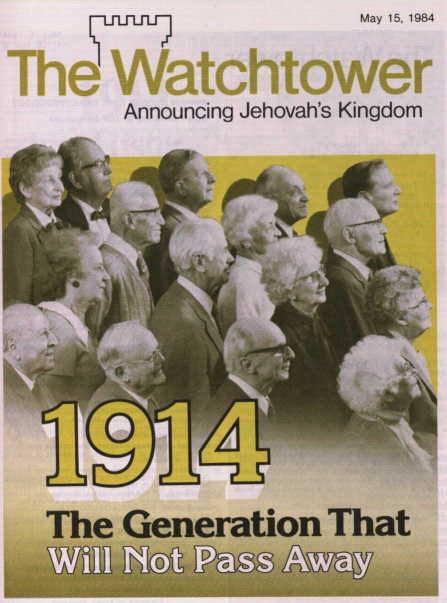 Any Jehovah’s Witnesses will tell you: Worldy persons who will loose their lives if they do not associate with teh Watch Tower organization! That – dear reader – is an organization who is saying that it has the power of eternal life and eternal death. I should mention that no where in this dedication and baptismal vow is the holy spirit mentioned. In its place is God’s spirit-directed organization. This is not the same as the holy spirit. Ones good standing should be with God and Christ as a concern, not an organization of men – headed up primarily by White men – who are no better or lesser than the rest of us. No human holds the keys to any of us being granted eternal life or eternal death. In God I have put my trust. I shall not be afraid.What can earthling man do to me? Upon me, O God, there are vows to you. I shall render expressions of thanksgiving to you. For you have delivered my soul from death [Have you] not [delivered]my feet from stumbling?— That [I] may walk about before God in the light of those alive. Does one reallythink if their meeting attendance at the Kingdom Hall is irregualr or nonexistent or if they irregularly do field service or not at all, that God will brush them off as insignificant? That will never happen! It is the organizatiosn fo men who created these requirements who willnot be happy with you because you will not be following THEIR requirements. It is men who will unlovingly dismiss you and make you feel unworthy of God’s love. Love they themselves will not express to you. Thus, it was never love in the first place, was it? The love of God and Christ will never fail you. God has proven that time and time again and will prove it on a much grander scale in the future. Previous ArticleIs Easter a Teaching of Christ? Next Article Who Will Preach The Good News?